A colleague of mine – a strong, brilliant, creative woman – recently took to Facebook to note the amazing experience of putting good energy out to get good energy back. In her post, she warned those inclined to mansplain the experience not to try to convince her she was wrong, because she believed in this energetic relationship to the universe. Almost instantly, a man attempted to explain what was really going on, that it was just coincidence, and oh by the way, here’s a book to explain it in case my authority as a male-presenting, male-identified human wasn’t authority enough. My colleague called him out, noting that his response felt, to her, like mansplaining, and that over time these kinds of comments from men resemble micro-aggressions. I noted a comment or two later that this reminded me of when an ex-boyfriend tried to mansplain “mansplaining” to me on a Facebook thread, which completely ended any connection we had. I also went to private messages to tell my colleague that I was proud of her being willing to call out the behavior in a firm but gentle way, which often helps people see their places of privilege. She thanked me, and told me that a number of women had said the same thing to her privately, but I was the only one who spoke out about it in public as well. I returned to the thread, to discover that another woman passive-aggressively called out…my colleague. I sure hope no one ever singles me out unfairly, she wrote to my colleague. Women are supposed to defer. And if they’re not, they are still supposed to let men explain things to them. And when they react to that mansplaining, they are encouraged to be quiet and not do anything about it. And women are not supposed to pile on, but rather provide quiet, behind the scenes support. At least that’s what we’re taught. But how can we change the behavior if we don’t name the behavior? Neither the person who mansplained nor the person who subtly told my colleague to be quiet are inherently bad or unaware people. They are justice-seeking, open-minded folks who stand on the side of love. Yet in a matter of hours, both displayed behavior that is meant (even unconsciously) to silence, scold, or shame. 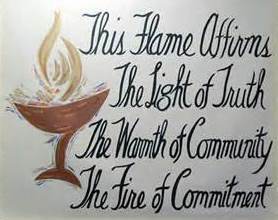 As Unitarian Universalists, we regularly put our faith into action – preaching, writing letters, marching, protesting, confronting, and sometimes committing acts of civil disobedience. But time and time again, we let injustice remain inside our walls, for the good of covenant, to keep peace in our beloved community. So when female-bodied ministers are judged by their clothes and not their message… when LGB but not T is welcome… when words from people of color are regularly omitted or misappropriated or silenced … when those who call out our own class inequality and fair pay issues are told they don’t understand the system… when a colleague is mansplained to and then shamed into silence… we are failing our community, our covenant, and our faith. I am proud of my colleague. Her words surprised the man, who – to his credit – not only realized what he had done but apologized. And they are still friends. His being called out on this expression of male privilege helped him see that privilege, and I suspect he won’t do it again; or if he does, he might realize what he’s typed and hit Delete instead of Send. We need to do more of this. We are bound by covenant to speak truth to each other, to seek justice amongst each other. None of us is perfect, and none of us is guiltless. But if we are willing to be prophetic witnesses to each other, we will be better prophetic witnesses to our communities and our world.